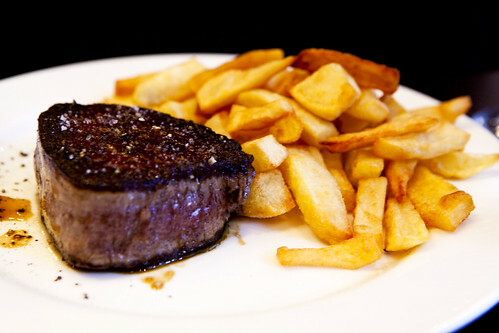 When you go to any French brasserie in the world, whether it’s in New York City or Paris, the dish that one would always find on their menu would be steak frites. 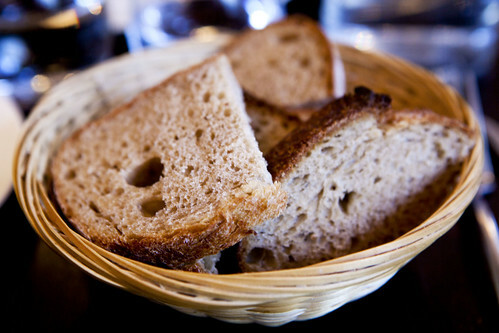 Scouring through Paris food guides like Clotilde’s Edible Adventures in Paris and Paris Chowhound, I ended up reserving a table at Le Bis du Severo. 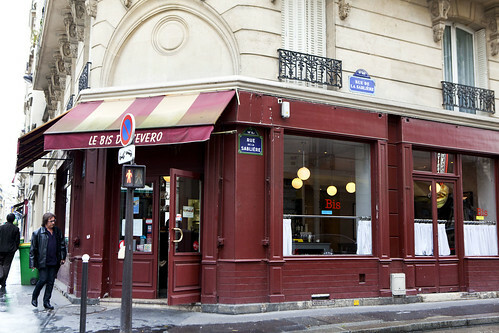 Le Bis du Severo is an annex to Severo, both restaurants are owned by a former butcher from Nivernaises who is passionate about his meat. 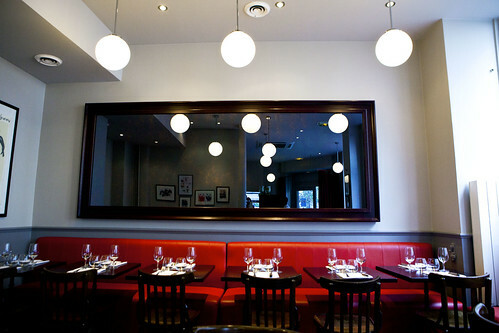 The interior is sort of retro-modern with the black and white checkered tile floor, burgundy red banquettes, and a small zinc bar up at the front. Getting seated and settled down, HC and I perused the menu. Even though it’s in French, the wait staff were very enthusiastic to translate the menu for us in English. (I didn’t need it but HC does.) 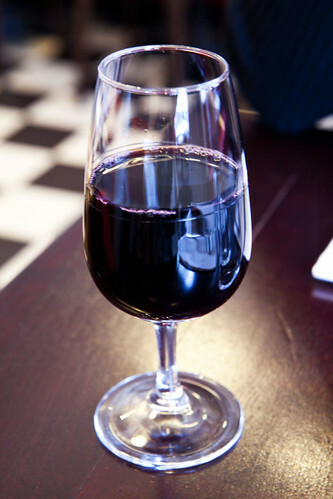 We ordered a glass of a deep, rich red wine in preparation of our main course: steak, and snacked on the bread while we’re waiting for our appetizer to come out. 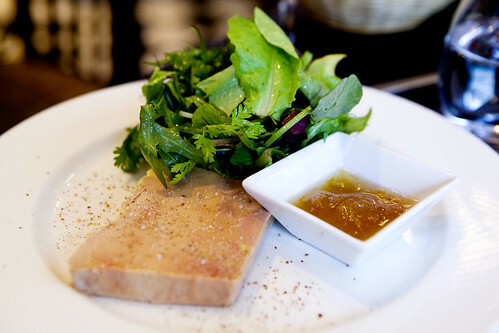 Knowing that we’re not extremely hungry (from roaming around Paris for pastries), we split a house made foie gras terrine with yuzu confiture and salad. The foie gras was served cold as any charcuterie would. The foie gras was creamy and rich like butter and a little liver-y in flavor, in case you never had it. The yuzu confiture (or jam) was a good foil to cut the richness and add a touch of sweetness, while the salad is the only little bit of healthy food on that plate. HC had the fillet mignon with frites, done bleu because she likes her steak as bloody as possible without it being raw on the outside. As she cut through her tender cut of beef, it was indeed, bleu with a nice burnished crust on the outside. 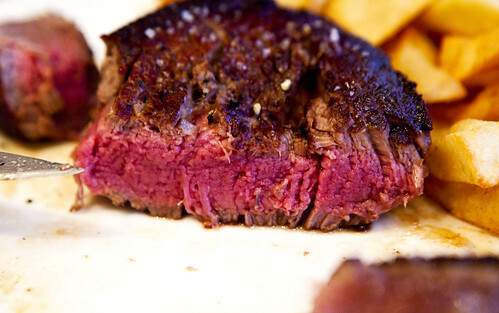 It’s juicy, flavorful with a mineral flavor in the background, and melt-in-your-mouth tender. The frites were rustically thick cut, delicately crisp and potato-y on the inside. 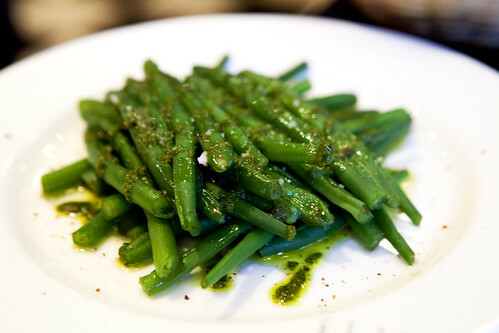 The unexpected thing was the plate of haricot verts with pesto that the kitchen provided us. I guess they’re mindful of getting some kind of fiber into our system besides going overboard with the meats. The haricots were very fresh and cooked perfectly though the small quip I would say that the pesto was a touch oily for me. For myself, I had the steak tartare. 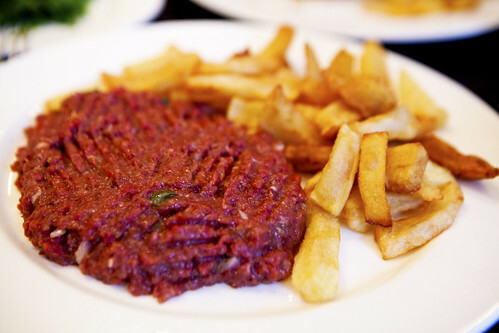 About four ounces of raw beef that’s been ground up with finely minced onions and parsley with a hearty side of frites. This simple preparation of tartare was pretty good and very hearty on the palate. I would add a little more salt to it to bump up the beef flavor. Looking back at my notes, this dinner was about 45€ per person. 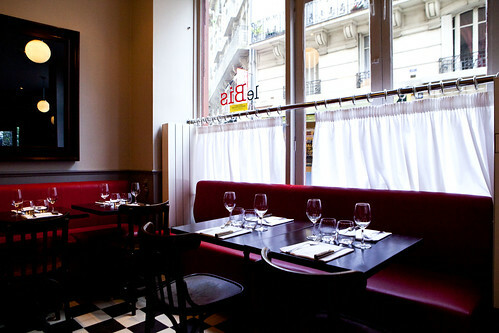 Le Bis is a relatively inexpensive restaurant (for Paris standards) that serves very solid meat dishes. The menu is mainly limited to meats with a seafood dish or two but it works for their specialization.